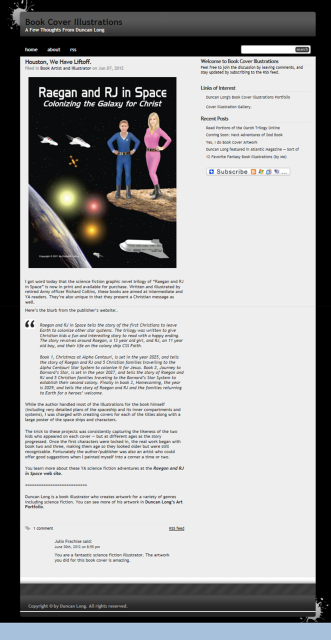 Here are some interesting stories and news items about "Raegan and RJ in Space!" 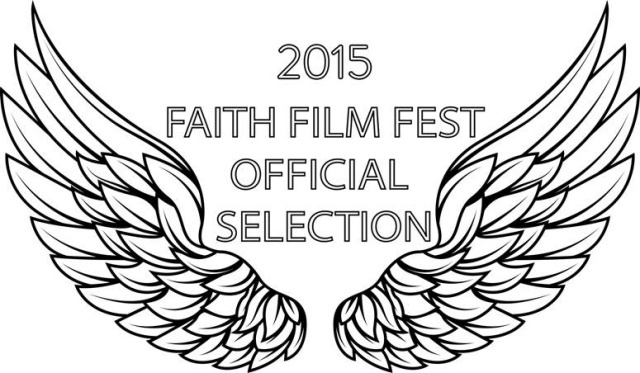 6 Aug 2017: 'Raegan and RJ in Space: First to Mars' was in the Christian Family Film Festival in Ellington NY and given the BEST ANIMATION award. 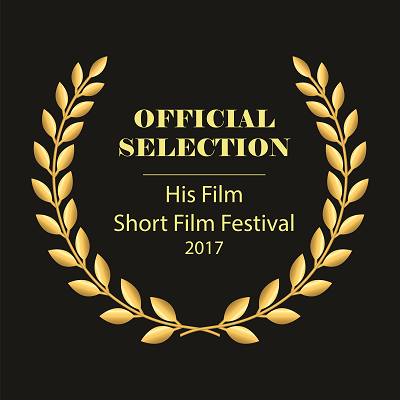 21 April 2017: 'Raegan and RJ in Space: First to Mars' was shown at the HIS Film Festival in FT Lauderhill Florida here are the official selection laurels! 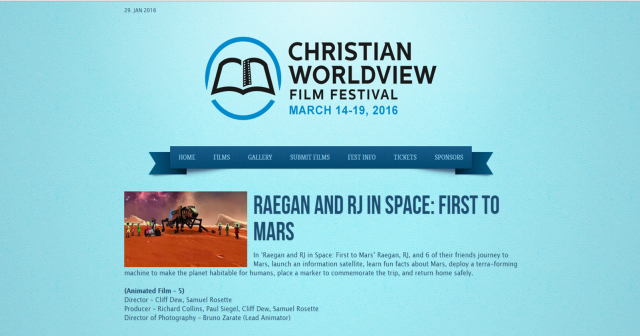 14 March 2016: 'Raegan and RJ in Space: First to Mars' was shown at the Christian Worldview Film Festival in Texas! 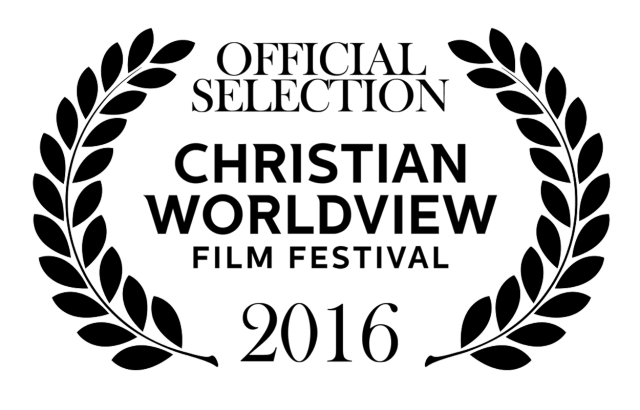 Here is a picture of the laurels we were awarded and our film on their web site! 13 Dec 15: R&RJiS publishes its second annual Christmas catalogue featuring the graphic novel trilogy done by Ms Lusong! 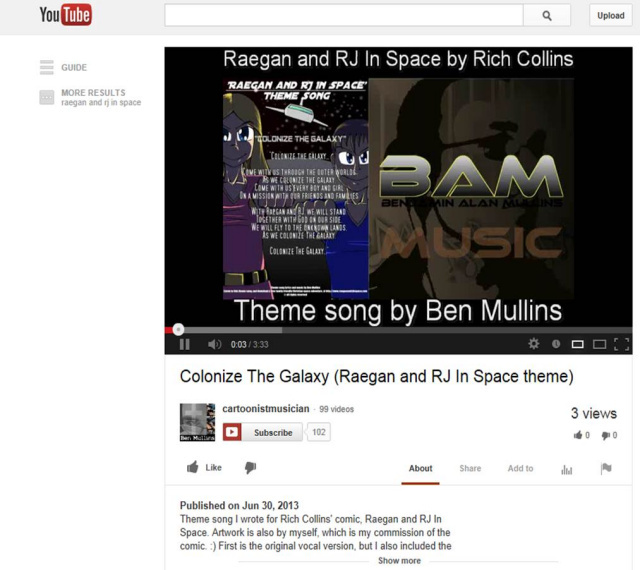 11 Dec 15: Raegan and RJ in Space: First to Mars acheived 500 YouTube views! A great day for R&RJiS and Christian family freiendly space adventures! 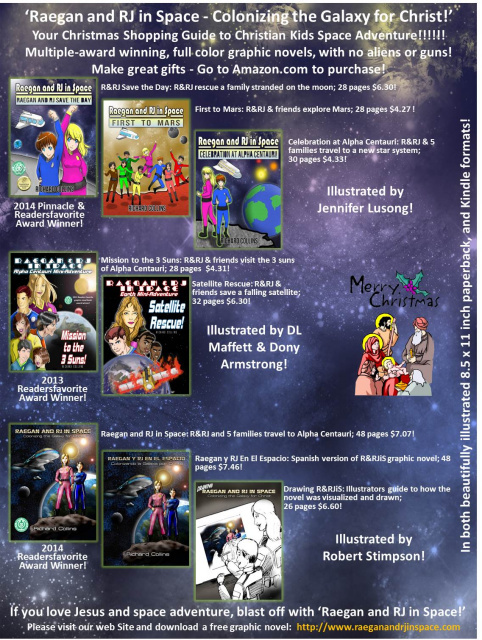 1 Sep 15: 'Raegan and RJ in Space: First to Mars' was selected as a Readersfavorite.com book award winner! 11 Dec 14: 'Raegan and RJ in Space: First to Mars!' was announced as a 2014 Fall Pinnacle Award Winner! See the awards abnd reviews page for more details! 7 Dec 14: R&RJiS First Christmas Shopper Guide put on Facebook here it is! 18 July 14: Today we mailed off the 3 copies of 'Raegan and RJ in Space: Colonizing the Galaxy for Christ!' that will be used in the charity auction at the Star Trek convention in Illinois in August! 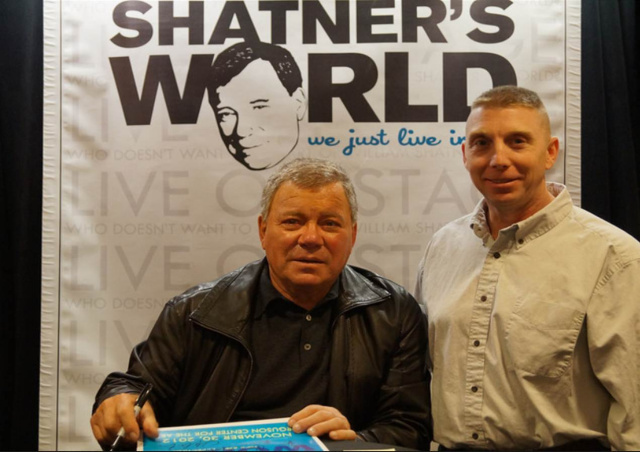 This is a big event, the 40th anniversary of the Star Trek fan club called STARFLEET! Here is a picture of the graphic novels right before we mailed them. They look great! We can't thank Mr. Stimpson enough for his awesome work illustrating them! Woo hoo! 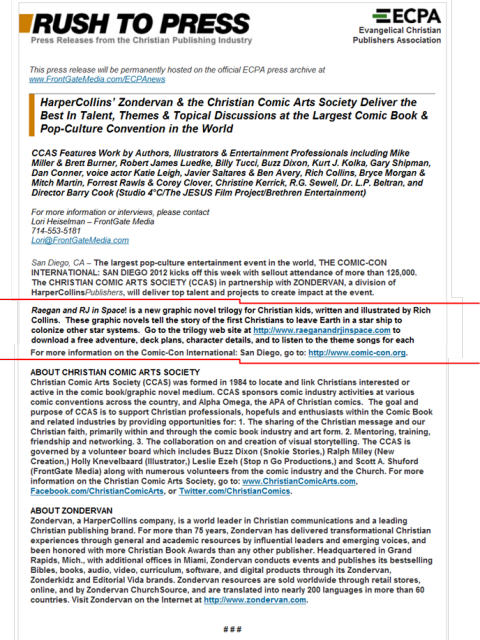 1 July 14 - 'Raegan and RJ in Space' is featured in a Christian Small Publishers Association (CSPA) E-blast which went out to thousands of Christian small publishers and book stores. 14 June 14: 'Drawing Raegan and RJ in Space - Colonizing the Galaxy for Christ' received 5 out of 5 Stars by Readersfavorite.com reveiwers. Thank you Mr. Stimpson for your wonderful illustrations! See the 'Awards & Reviews' page to read the review! 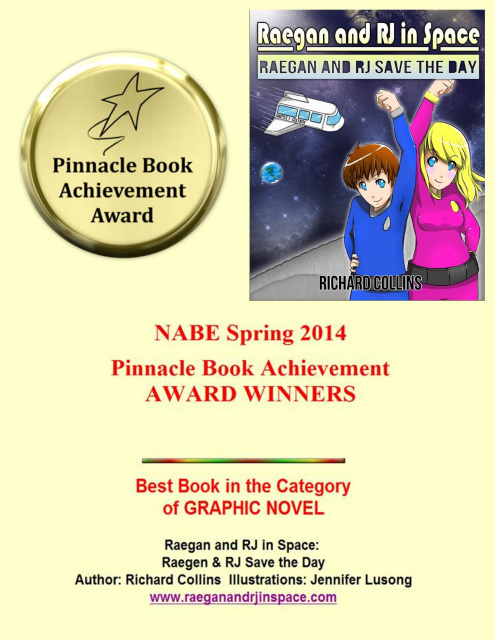 29 Apr 14: 'Raegan and RJ Save the Day' was anounced as a '2014 Pinnacle Graphic Novel Book Award' Winner! Thank you Ms. Lusong for your wonderful illustrations! See the 'Awards & Reviews' page for more details! 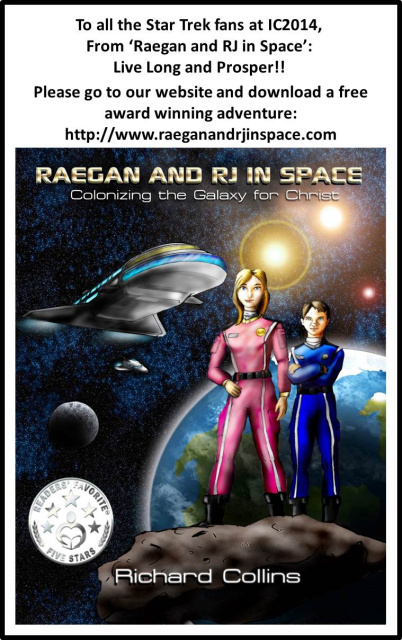 29 Apr 14: 'Raegan and RJ in Space - Colonizing the Galaxy for Christ' received 5 out of 5 Stars by Readersfavorite.com reveiwers. Thank you Mr. Stimpson for your wonderful illustrations! See the 'Awards & Reviews' page to read the review! 23 January 2014: The author joined the Christian Small Publishers Association (CSPA)! The CSPA exists to represent, promote, and strengthen the small publisher in the Christian marketplace. Their web site is http://www.christianpublishers.net if you want to check them out. It is pretty good. They have a lot of tips and resources if you are an independant author. We plan on advertising R&RJiS on their web site and also in their annual catalogue. This will be great! Even though we are not small publishers since we have the R&RJiS collection so they said no problem. 27 Oct 13: 'Raegan and RJ Save the Day' received a 5 Star review from Readersfavorite.com and was awarded the seal below. Thank you Ms Lusing for your ourstanding illustrations! See the review on the 'Awards and Review' page! 1 September 13: 'Raegan and RJ in Space: Mission to the 3 Suns' was announced as a 'Readers Favorite' award winner! See the awards page for details. Thank you Mr Maffett and Mr Armstrong for your great illustrations! They only gave out 2 awards for graphic novels this year, out of all that were submitted, and ours was one of them! 'Go Raegan and RJ in Space!' on Youtube!!!!!!!!!!!!! 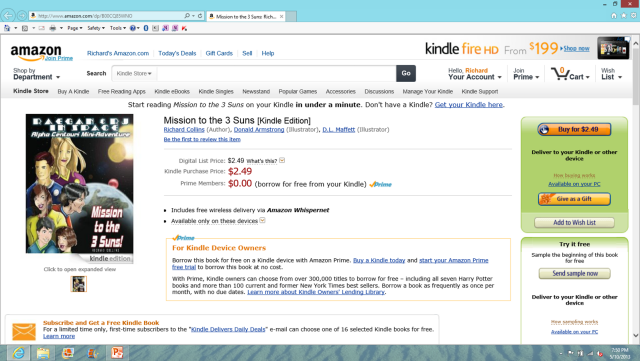 10 May 13: KINDLE!!!!!!!!!!! Today the first 'Raegan and RJ in Space' adventure was published on Kindle! 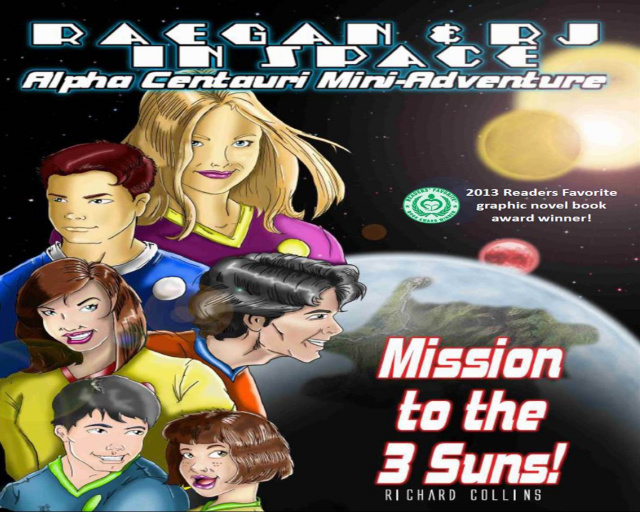 'Mission to the 3 Suns' is the mini-adventure from Alpha Centauri where Raegan and RJ and their friends go on an adventure to place information satellites by each of the 3 suns there! It is the first professionally illustrated adventure! It was illustrated by D.L. Maffett and Donald Armstrong! It is available now at this site as a free downlaod, on Amazon for a hard copy, and now on Kindle! 30 Mar 13: 'Chick-fil-a' Happy Meals! THIS WOULD BE SO COOL! Well today the author got with one of the very talented artists who did some R&RJiS cover art, and we began planning and thinking about doing the 'Raegan and RJ in Space' happy meals for Chick-fil-a! We have absolutely no idea if Chick-fil-a would be even interested in a 'happy meal' but we are dreaming big. The idea will be to have 6 versions, each consisting of an 11"x17" sheet of paper printed both sides with an adventure on it, and one of 6 small action figures - 3 boys and 3 girls. The sheet of paper will be printed both sides that is folded 4 times into a little square and will consist of a very short version of the graphic novels. The 6 papers will be one the adventures consisting of either Book 1 where they colonize Alhpa Centauri, Book 2 where they colonize Barnard's Star, and the 4 mini-adventures, for 6 total versions. Then we will get a very simple version of the 6 main kids characters made as little action figures. That will be 6 different types, consisting of an adventure and a small action figure. There will be 3 boy versions and 3 girl versions. We will put them in little zip lock bags. I don't know how much it will cost, or if Chick-fil-a would be even interested in a little Christian space action adventure type deal for their meals. Who knows! 20 Feb 13: 'Go Raegan and RJ in Space!" - IN SPANISH! Or as we can now say Go 'Raegan y RJ en el Espacio!' Well the cover is done for the special 'Raegan and RJ in Space!' version done in Spanish! Here it is! Isn't it awesome? Right now the graphic novel is being translated into Spanish! Some time this summer kids in Spanish speaking countries will be able to blast off with Raegan and RJ! 23 Jan 13: We put in a proposal to have R&RJiS Action figures made. Please go to the 'Free Downloads!' page to #15 and you can see the proposal we submitted to a toy company. Hopefully it can be done for a reasonable price. We will keep you informed! This would be so cool! 11 Jan 13: 'Hola' (hello) Raegan and RJ in Space fans. Today R&RJiS started a journey to become a Spanish language graphic novel! Some time early this year the short version of book 1 will be translated and published in a Spanish version! Fantastico! (fantastic! ); Asombroso (amazing) ! (amazing! ); and Adios (good bye!) friends. We will keep you updated! 31 Dec 12: 'Raegan and RJ in Space!' has had it's most popular month yet! Due to the popularity of the sales, R&RJiS spent an amazing 22 days below the 400,000 mark on amazon! Considering the over 3 million books and 1 million authors on the site selling books, this is an amazing achievement! In addition, on 8 Dec 12 R&RJiS was ranked at #113,696! See the chart below for this amazing news from amazon! Thank you to all the R&RJiS fans who made this possible! 9 Nov 12: 'Raegan and RJ in Space!' joins the social media revolution! Did you know there are over 850 million FACEBOOK users all over the world? Just think, this will help us tell kids all over the world how great Jesus is! On this day, 9 Nov 12, the trilogy got a FACEBOOK page at the following address: http://www.facebook.com/pages/Raegan-and-RJ-in-Space/172526572885818 . 28 Sep 12: Web alert! 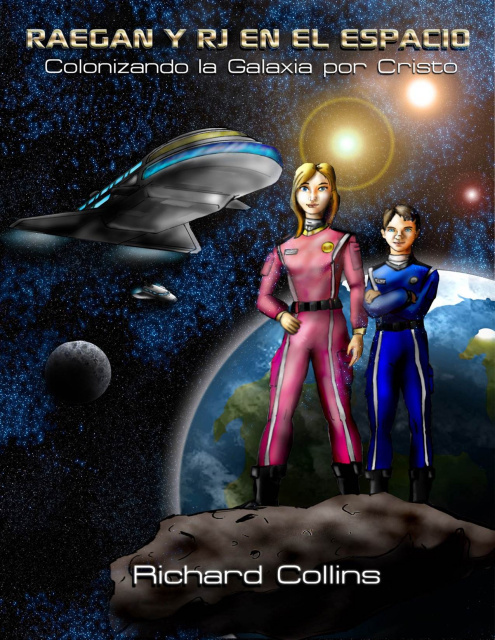 'Raegan and RJ in Space Book 3: Homecoming' graphic novel, has been linked to the topic of 'hydroponics' by the web search engine company MITRA. Mitra is a search technique which groups web content by topic when a search on Google is conducted. If you do a search for 'Raegan and RJ in Space hydroponics' you will get a link to the 'MITRA Agriculture' site and on it at the bottom will be graphic novel 3! 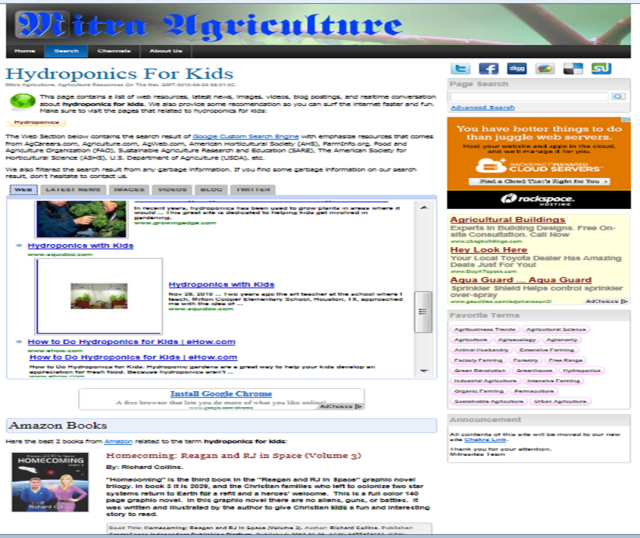 Here is the link to their web page: http://agriculture.mitrasites.com/hydroponics-for-kids.html This is because in book 3 the kids explore the star ship's hydroponics lab. Also, Mr Hojnacki did an 'amazing art' of this scene, which is posted to our 'amazing art' web page. Hydroponics is the science / process of growing food in water and nutrients versus dirt and ground. The author has been fascinated by this since seeing a working hydroponics lab at EPCOT Disney World in 1976. All of these web hits made graphic novel 3 popular enough to be linked. Here is a screen shot of the Mitra web page with our graphic novel at the bottom! 7 August 12: Full Color "Raegan and RJ in Space!" trilogy donated to the Liberty Baptist Church of Hampton VA by the author so Christian kids in that church can read the stories. Here is their web site http://www.lbcmin.com if you want to go to it and see this wonderful church. The author went to this church to see a Tim Hawkins comedy show this spring and he was sooo funny. We laughed for three hours straight. If you have never seen Tim Hawkins go to some of his youtube videos. Try googling one of his funniest videos "Tim Hawkins Things you don't say to your wife" and click on the youtube video you will laugh so hard. Here is what we donated: Here is a link to his youtube video "Things you don't say to your wife!" Raegan and RJ in Space! is a new graphic novel trilogy for Christian kids, written and illustrated by Rich Collins. These graphic novels tell the story of the first Christians to leave Earth in a star ship to colonize other star systems. Go to the trilogy web site at http://www.raeganandrjinspace.com to download a free adventure, deck plans, character details, and to listen to the theme songs for each book. 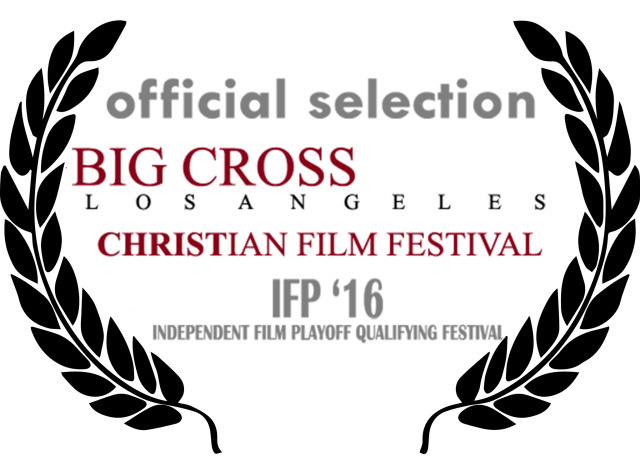 Here is the link to the CCAS news release: http://live.hollywoodjesus.com/?p=10408 if you would like to see it. 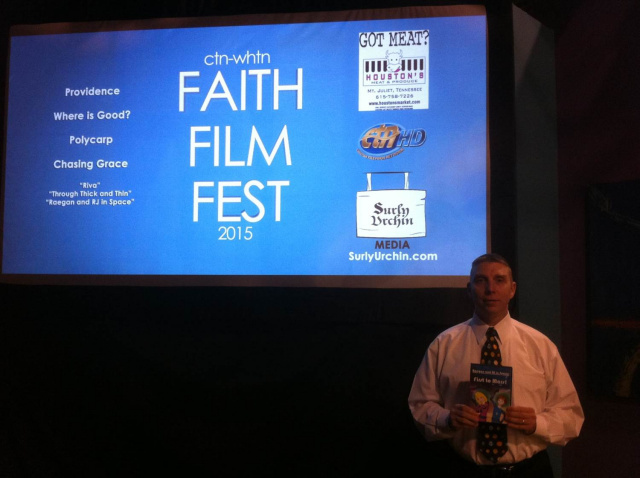 Thank you FrontGateMedia and Mr Scott Shuford of the CCAS! 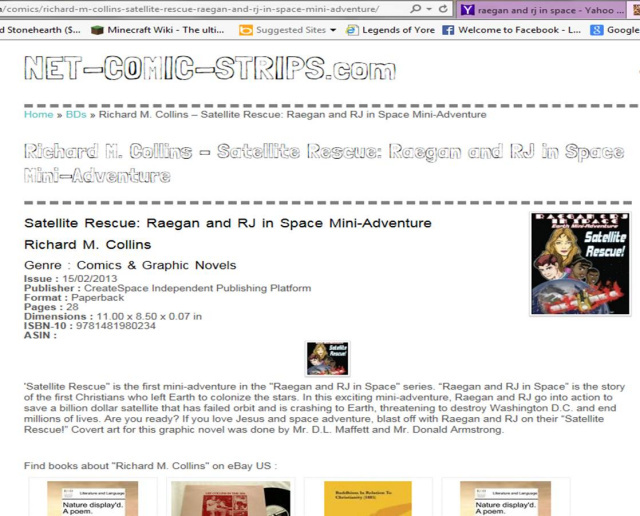 June 2012: Mr. Gerard Lee of Hawaii who purchased and read both the digital and hard copies of the graphic novel trilogy, wrote the following on his web site: "Raegan and RJ in Space! by Richard Collins is a Christian comic/story book trilogy. Lovingly illustrated, these full color books are available for a small charge as downloads and also as lovely full color books. Perfect for parents and children to spend time together reading." "
7 June 12: Duncan Long, world famous cover artist, wrote about creating the R&RJiS book covers in his blog. Here is the link to his blog http://duncanlong.com/blog/?p=4401 if you want to go look at it. Here is what Mr. Long wrote: Got word today that the science fiction graphic novel trilogy of “Raegan and RJ in Space” is now in print and available for purchase. Written and illustrated by retired Army officer Richard Collins, these books are aimed at intermediate and YA readers. They’re also unique in that they present a Christian message as well. While the author handled most of the illustrations for the book himself (including very detailed plans of the spaceship and its inner compartments and systems), I was charged with creating covers for each of the titles along with a large poster of the space ships and characters. The trick to these projects was consistently capturing the likeness of the two kids who appeared on each cover — but at different ages as the story progressed. Once the first characters were locked in, the real work began with book two and three, making them age so they looked older but were still recognizable. Fortunately the author/publisher was also an artist who could offer good suggestions when I painted myself into a corner a time or two. You learn more about these YA science fiction adventures at the Raegan and RJ in Space web site." 7 Jun7We can't thank Duncan Long enough for our wonderful covers and poster!